I think I need to do a full exploratory of American Impressionists - the more I see, the more I like of their work. This magnet and this artist is no exception. Childe Hassam's Rainy Midnight was one of my favorite pieces from the Houston Museum of Fine Arts. And you can definitely see the touch of the Impressionists in his work - even if he wasn't part of their little circle of friends, he spent the late 1880s in Paris, and even exhibited at the Salons. Hassam painted this in 1890, freshly back from Paris. 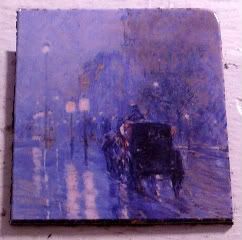 I'm fairly sure that I like it because the beautiful blue-ish purplish color palette closely matches my favorite Monet that I magnetblogged about before. I think the subject matter also makes a difference - the only thing better than a snowy night/morning in New York City is a rainy one. And, it's about 20 years off, but this scene is totally the Age of Innocence New York, which I love, love, love. I mean, can't you just see May peering out of the carriage, looking for Newland, cuz she just found out about the affair with Countess Olenska and she's tracking him down in the middle of the night? Wait? That didn't happen in your version of the book movie? I do wonder why Childe Hassam doesn't get more recognition. It has the impressionistic vibe but with a touch of everyday grit. Also, you're a May fan? Maybe it was Winona's interpretation, but I was solidly in Michelle Pfeiffer's corner. I don't know! I really dig his work. Haha, no, I wasn't even really a fan of the movie. I didn't like May on principle of being a weak woman, and I didn't like Newland for being a weak man. And I didn't like Ellen Olenska for her part either. Not surprisingly, I really, really, really loved Scorsese's portrayal of period NY.